With all the flurry of activity over the last week with Mac OS X 10.7 (Lion) being released along with an upgrade to Dragon Dictate from 2.0 to 2.5 we have had a few calls into our office regarding compatibility of MacSpeech Scribe with Lion. Upgrading to Lion on your Mac should be fine if you are running Dragon Dictate 2.0, I have personally done this and my Dragon Dictate is working without issue. Updating to Lion if you have MacSpeech Dictate 1.5 Nuance also claims should be fine, I have not tried this. But, if you are a MacSpeech Scribe customer the advice is to not upgrade to Lion from 10.6 (Snow Leopard). MacSpeech Scribe is the legacy MacSpeech product now maintained by Nuance which allows voice to text from recorded audio only. Personally I am surprised that with Dragon Dictate 2.5 the ability to transcribe from spoken voice AND recorded voice was not included, I am sure this has to have been high on the Nuance Mac teams priority list for some time but as yet is still not there. Keep an eye on my blog and the official Nuance Dragon for Mac website for any updates. 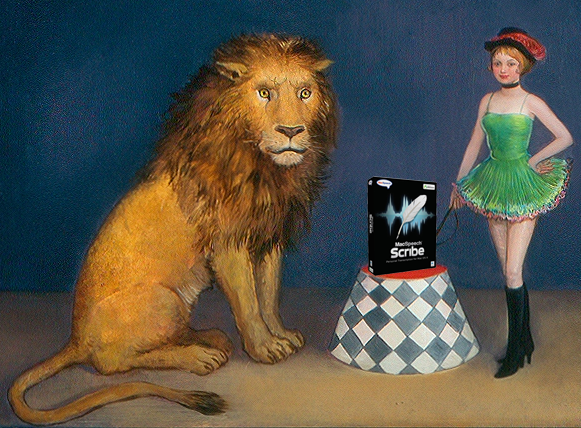 Beautiful Lion Tamer picture (without the MacSpeech Scribe box) oil painting by Jennifer Li, click here to see Jennifer’s amazing artwork. My old macbook air died and I now have a new one. I have Mac Speech dictate 1.5 which I can’t use on the new one! I have no idea what I should do- I tried downloading dragon dictate 2.5 but of course I don’t have the compatible english data disc to go with it! Do you have any suggestions? I don’t want to buy a whole new copy of this software. Congrats on the purchase of a new Macbook Air, what an amazing piece of kit that is !! If you are in Australia then I do have an option for you. There is an upgrade package from the older version of Dictate to the newer version, these are available from the people at MacSense.com.au so give them a call and they will be able to help you out. If you are outside of Australia then you will need to hunt down which distributor or reseller has the upgrade packages. Start with a call to your local Nuance reseller and see if they can help.